While you can certainly find a number of upscale eateries directly below the High Line, did you know that there is currently only one sit-down restaurant that's actually on the High Line? Dubbed Terroir on the Porch, the wine-bar-in-a-shipping-container may be petite, but it packs a big punch in terms of both flavors and ambiance. Click through our photo gallery to get a feel for the outdoor spot overlooking the Hudson, which boasts a succulent selection of vinos and eats that is just as enviable as its prime location atop our favorite elevated park. Terroir on the Porch is a little sister to the other Terroir locations in the city, but unlike its older sibs, it’s a seasonal outpost that will only be open during the warmer months. The no-nonsense black box kitchen, counter and register was designed by Richard H. Lewis Architects, who used a shipping container as the main structure after Terroir‘s owner noticed one being used as storage near the High Line and thought it would be the perfect mobile receptacle for the new location. We were curious about whether the container was recycled like many of ones we feature on Inhabitat, so we put in an inquiry with the restaurateurs who were obliging enough to try and find out despite being crazed with the opening of the newest Terroir (coming shortly). While a repurposed container would certainly be more desirable than new, we still think this is an adaptable, mobile and almost infinitely reusable application that also makes great use of the park’s already existing outdoor space to triple its size while adding almost no extra materials save a few tables and chairs. But enough about the architecture, you might be thinking, how’s the food? Well, despite being a smaller version, Terroir on the Porch offers the same kind of ultra-fresh, “elitist, but for everyone” rustic cuisine that chef Marco Canora crafts for the other Terroir restaurants. The menu includes fare like meatball subs as well as dishes with an emphasis on locally-sourced ingredients like a smoked chicken salad sandwich made with chicken from the Finger Lakes region. You can find Terroir on the Porch at the High Line at 15th Street and 10th Ave, Mon – Fri noon – 9:30 PM and Sat & Sun 11 AM – 9:30 PM. Now that's a great use for shipping containers (although shipping American goods the other direction would be even better). However, 'not sure I'd trust my Macbook to the side window in pic #3! Terroir on the Porch is a little sister to the other Terroir locations in the city, but unlike its older sibs, it's a seasonal outpost that will only be open during the warmer months. The no-nonsense black box kitchen, counter and register was designed by Richard H. Lewis Architects, who used a shipping container as the main structure after Terroir's owner noticed one being used as storage near the High Line and thought it would be the perfect mobile receptacle for the new location. We were curious about whether the container was recycled like many of ones we feature on Inhabitat, so we put in an inquiry with the restaurateurs who were obliging enough to try and find out despite being crazed with the opening of the newest Terroir (coming shortly). While a repurposed container would certainly be more desirable than new, we still think this is an adaptable, mobile and almost infinitely reusable application that also makes great use of the park's already existing outdoor space to triple its size while adding almost no extra materials save a few tables and chairs. Plus you get service with a smile! The outdoor area has beautiful views of the Hudson without needing much new infrastructure at all. But enough about the architecture, you might be thinking, how's the food? Well, despite being a smaller version, Terroir on the Porch offers the same kind of ultra-fresh, "elitist, but for everyone" rustic cuisine that chef Marco Canora crafts for the other Terroir restaurants. The menu includes fare like meatball subs as well as dishes with an emphasis on locally-sourced ingredients like a smoked chicken salad sandwich made with chicken from the Finger Lakes region. 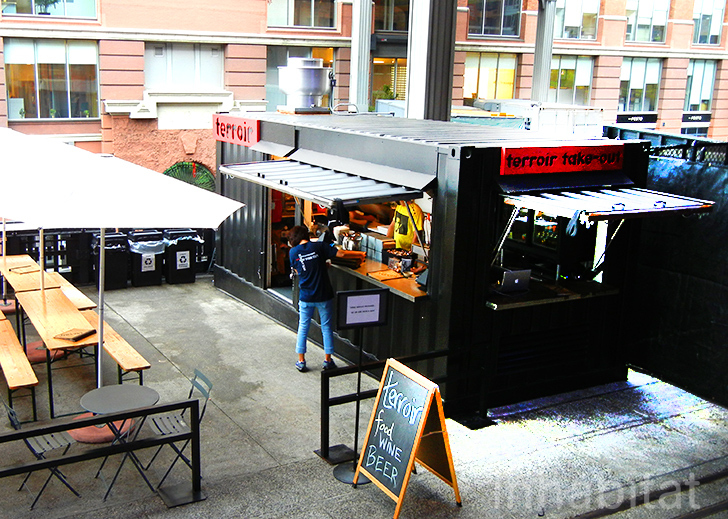 You can find Terroir on the Porch at the High Line at 15th Street and 10th Ave, Mon - Fri noon - 9:30 PM and Sat & Sun 11 AM - 9:30 PM. After lunch or dinner at Terroir on the Porch, why not hop over to People Pops right next door for dessert? You might even see this little guy along the way.